A climate control system will regulate the temperature within your Mini. Once you set the desired temperature, cold and warm air will be blended together in order to achieve that consistent level. Unlike standard air conditioning which will continually blast out either hot or cold air, climate control makes use of sensors and an internal computer to detect the current temperature within the cabin and then automatically adjust accordingly. 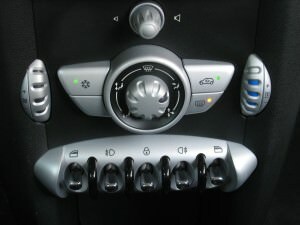 A problem exists with the 2002 model of the Mini Cooper, accentuated during hot weather, where the car can stall or stumble while in first gear when the air conditioning is on. This can result in dangerous situations on the road and should be inspected immediately. Another common problem lies with the 2003 Mini model, where the air conditioning panel on the dashboard won’t activate or respond to input. While often solved by switching the car off and on, it’s not a long-term solution as it could be a sign of faulty wiring of the climate controls. It’s important to have your Mini Cooper’s AC system regularly maintained, in order to detect and prevent any problems. Get it checked out as part of the Mini Cooper Inspection II, especially if you’ve been encountering issues with it. Problems with the AC could have a simple solution or require a complete overhaul of the system. Some possible solutions include recharging the refrigerant, rewiring the control unit, replacing the blower fan and flushing the system. At German Car Depot we stock many of the parts that are prone to common failure, allowing you to get back on the road safely and quickly. The best part is that we offer prices less than dealerships, saving you on the air conditioning repair cost, but still with the great mechanics and service that you would expect.